Our product range includes a wide range of non woven geo bags. The Non-Woven Geo Bags are made using jp geotextiles stitched on three sides with high tencity PP yarn to give very high tear strength. 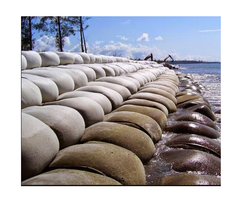 In compare to conventional erosion protection work using C.C. Block, gravel, hard rock etc, sand filled geobags technology involves less cost. The constructing materials like sand of geo bag are locally available and cost-effective compared to importing boulders from other countries. The manufacturing of geo bags and quality control of the bags are easy compared to the C.C. blocks and boulders. These geo bags can be customized in different sizes and forms that suits the requirements of design and installation. The bags can ideally be placed on dry land but can also be installed into the water of any depth.